TL;DR: Review carefully. Don't delete everything. Deletion is for things that actually aren't answers, not for low-quality answers or "wrong" answers. Flag incorrect comments from review as "not constructive". Recently there was a movement to "burn down" the low quality posts queue. This is a fine proposition, the queue is big and it does need to be reviewed. I've been reviewing low quality posts in earnest for several months now, and here's what I've noticed: People tend to just delete everything. Sure, most posts in the queue are crap. I get that. And reviewers have been doing a good job of executing justice on these junk answers...in the same way that courts would if they just sentenced everyone to 10 years in jail unless they could really really prove they were innocent and happened to have some good treats for the jury. Everyone reviewing LQP needs to review Shog9's awesome answer post. Right now. Go on, I'll wait. What I'd like to focus on here is low quality and "wrong" answers. This is where I see the biggest issue. Low quality answers. 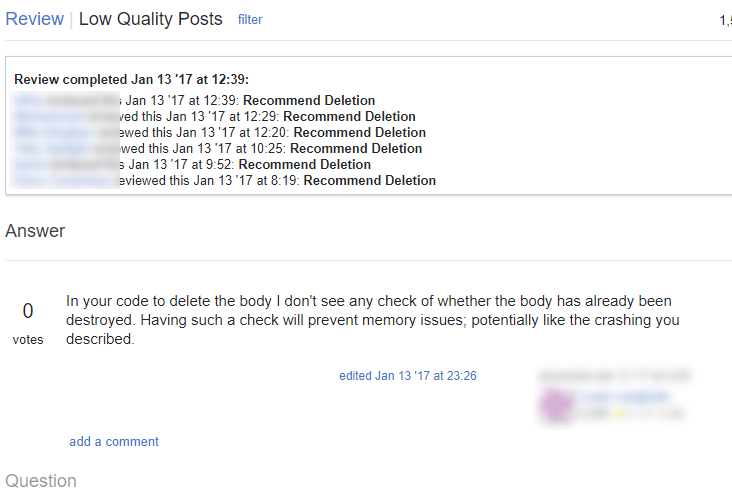 Yes, I know the queue is named "low quality posts", but not every minor problem needs to be deleted. Consider first if you can edit - or leave a comment for the author asking for more details, a better explanation, etc. Only if you can't plausibly imagine anyone putting in the work to fix the post should you opt to delete these kinds of answers. For example, an answer might not have description for why the code works, but it still shouldn't be deleted; just leave a comment asking the author for an explanation, and move on. This does attempt to answer the question. It may be plain wrong — but that's something for downvotes and comments to decide. Not deletion. This is why we have the voting system — if something is wrong, it should float to the bottom below all the other not-wrong things. This is the system working. There will always be people reviewing that do this. They leave auto comments from review on answers that don't really need them. When I review, I delete the things that need it — link-only answers and (real) non-answers. But more importantly, I click 'looks OK' on the things that shouldn't be deleted. I've asked before if this is what we should do. The answer then, and now, is a resounding yes. 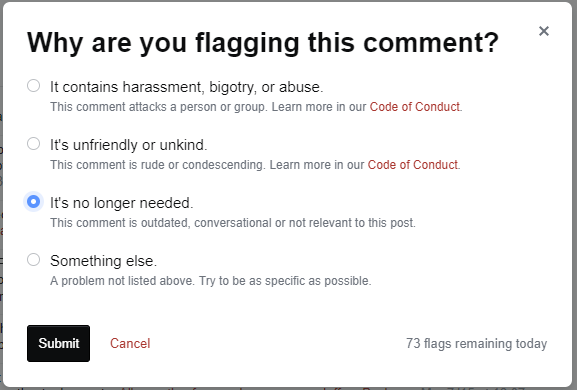 When you see a review comment that simple doesn't fit a post, please flag it for moderator attention with "not constructive." They're easy flags to review, and they make a difference in the site. One possible solution to the incorrect review problem is to change the UX of the review interface - ManishEarth sums up the proposal quite nicely. I agree with this in principle. If an answer is just flat-out wrong, that does not in and of itself qualify it for deletion. An incorrect answer does not make it low quality. There can be some very high-quality answers that are simply factually incorrect. New questions posted as an answer. Attempts to reply to existing answers. Answers that are nothing but links with no explanation. Answers that clearly have nothing at all to do with the question. Answers that could really be better-suited as comments. These are often short one-liners that technically attempt to answer the question, but are really nowhere near enough to actually help anyone solve the problem at hand. Answers that might answer the question but don't have any explanation attached to them. Code-only answers are a common example of this, but they can also be answers that just say “do this thing” without explaining why or what that even means. Let me address these one at a time. 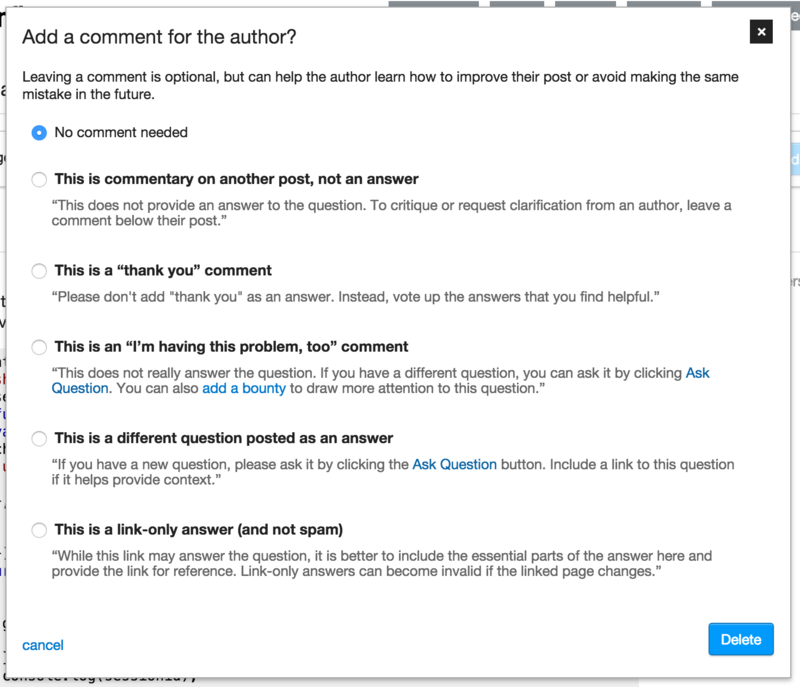 Should answers that should be comments be deleted? This might be somewhat controversial, but I'm of the opinion that yes, these should not be allowed as “answers” to questions on Stack Overflow. Is it a good answer? No. But it is an answer, and there's no reason to delete it. What's the difference? In the former, the answer directly addresses the problem posed by the asker of the question. It's a poor question, but that's irrelevant. In the latter, the asker actually included a relatively specific problem as well as some code that requires a much more substantive answer. That answer should be a comment. I think in these cases, what qualifies as an answer actually can be context-sensitive. I'm perfectly willing to click-through to the question to take a look at what's actually being asked. Should answers with no explanation be deleted? This one is a little less clear-cut. There is absolutely no explanation about what that code does, how it addresses the problem, or why it's the correct solution. It's not even really clear why that code is at all relevant to the question. Furthermore, there already exist other answers that are far superior to that one, those that actually answer the question. Keeping that poor answer around isn't going to help anyone. Is this a stellar answer? No. Very much no. But it explains why the code posted is an answer to the question. Just by saying “try the null coalescing operator”, the answer is given enough context so that a specific piece of information can be extracted from the code snipped and applied elsewhere. In the previous, poor-quality answer, there was no indicator how that answer could be used any where else because it wasn't clear what was the solution and what was just boilerplate code. Again, it's clear what's changed, and it's clear what the hell the answerer is actually attempting to convey. Learn to love “No Comment Needed”. See that? You can vote to delete questions without leaving comments! Especially if something should not blatantly be deleted, don't pollute the world by clicking one of the comment reasons just because you can. Those comment reasons let you leave comments without having to think about typing out comments. They're tempting. But with great power comes great responsibility—please don't abuse the feature. One more thing—that image Shog posted a while back? That was about Not An Answer flags. “Very Low Quality” and “Not An Answer” flags are two very different things. Just because something's technically an answer doesn't mean it should be kept around. That said, the point you made in your question is quite sound, and I agree—more discretion is needed in the Low Quality Posts queue. I just don't believe that the absolute you proposed in your question is wholly accurate. "But wait!" - I hear you saying - "these two seem to contradict each other, which one I pick?" Not really. These simply complement each other and are meant to be used in different context. Guidance you refer lays out approach to evaluate delete-worthy posts quickly and safely and ensure that mistakes in doing this are minimized. If you are (are you?) a diamond moderator acting on one of (hundreds!) routine flags you get every day, you better stick with this guidance as firmly as you can - because if you don't, there is a real risk of accidentally deleting valuable content. Another guidance is for the cases when one can (should) invest substantial effort into studying and curating reviewed content. If, again, you are a diamond moderator, this guidance applies to rare, "special cases" where you are expected to go beyond routine quick evaluation. You see, guidance for diamonds moderators is essentially to act depending on how much time and effort they are expected to put into content review. I think that a regular user reviewing LQ posts can follow this approach as well. Worth noting that at 20 LQ reviews a day limit, one has plenty time to do more thorough check of reviewed posts... Not to mention that there is no shame in using “Skip” if it feels too much work. Could you please  in an explanation of why this code answers the question? Code-only answers are discouraged, because they don't teach the solution. This actually works. I have had numerous people who have then gone and edited their answer to include an explanation of the code! I'll say for myself why I am (ab)using the "low quality" queue instead of votes. Because downvotes take a toll on my reputation while the flags are "free". The rationale is: my hard-earned rep doesn't deserve to suffer because someone posted crap. That's because, by Pareto principle, there's orders of magnitude more crap than good stuff, so I cannot possibly downvote everything that deserves it and retain a positive score. I'm not saying this is the right thing to do. I'm saying that I'm working around a flaw in the system that would otherwise rip me off. I can only speak for myself. But I do imply that most probably, I'm far from being the only one, and the situation that led to the current topic is a direct result. Remember that the vast majority of users with the privilege do not have so many rep points and steady income that they no longer care about a few (dozen). Should I be concerned about delete reviews on reasonable but brief answers? Why was I suspended for this review? Which reason would I use to recommend deletion of an obsolete answer in Low Quality Posts? What to do about pointless* answers?